Professor Michael Stephenson is Director of Science and Technology at the British Geological Survey, but before becoming a leading international research geoscientist, Mike worked as a school teacher in rural Africa (Botswana). It is therefore no surprise that his text book targets students, particularly those at advanced level and undergraduates. His aim is “an introduction to a number of connected issues in energy and climate change, including the carbon cycle, climate change in deep time, the ‘fossil economy’, the role of geology in climate change abatement and adaptation, and the importance of geological measurement and system understanding”. The nine chapters are well structured for learning and further study. There are numerous references, illustrations and tables to support the text. Each chapter follows a similar structure: there is an introductory section which sets the chapter’s context and aim, followed by a logical sequence of topics, ending in a summary highlighting the main learnings. A bibliography follows referencing text books, primary research and review papers, and policy outputs, thus providing a gateway into deeper study. The first chapter describes how fossil fuels are formed and how, as their name implies, they are intrinsically related to biological processes and to the long-term geological carbon cycle, while Chapter 2 demonstrates that “the huge span of geological time shows many instances of natural climate fluctuations that have an endogenous Earth system origin, such as volcanicity, some of which have been severe enough to affect the continuity of life on Earth”. Chapter 3 reveals how important human activities are in relation to climate change; in fact, just as influential as natural processes. “The problem is that humankind short circuits the long-term geological carbon cycle by burning fossil fuels and upsetting a complex balance or equilibrium,” he says, explaining how changes in the rate of human consumption and manufacturing in the 1950s have apparently generated an ‘inflection point’ known as the Great Acceleration. The next chapter continues with this theme, looking at how this Great Acceleration might proceed, “given that the developing world is probably poised to industrialise and to experience changes in living standards, wealth, and energy usage”. Chapter 5 describes how geological processes and materials are not only intrinsic to the long-term carbon cycle, and therefore to energy and climate change, but also can be part of the solution to climate change, with much of the chapter discussing carbon capture and storage and how it could be a counterbalance to the fossil-fuel short circuit. Chapter 6 “looks at how the subsurface could play a part in how humankind adapts to climate change. The main ‘vector’ of climate change is likely to be water, and groundwater in aquifers provides backup for surface water variability in relation to seasonal variation and perhaps to more long-term climate change”. Chapter 7 perhaps shows most clearly the need to understand and study the processes of the past, but including the recent industrial human past as well as geological history. 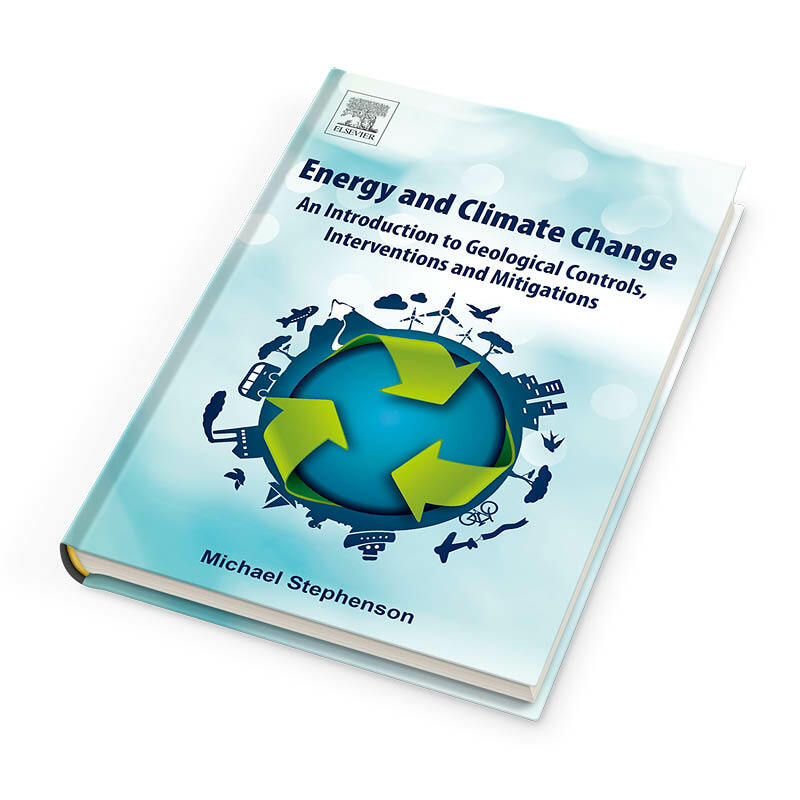 It discusses how human energy systems and economies built around hydrocarbons contain mechanisms that operate in similar ways to the physical science feedbacks and tipping points of the natural climate system and many other natural systems and cycles. The next chapter focuses on technology, which, as well as having lifted living standards and health, has placed humankind at odds with its environment, yet also delivers the means to help us to adapt better through enabling us to monitor, measure, and understand the environment. The ability to intervene in an intelligent way to reduce climate change, or better adapt, can only come from a greater understanding of Earth processes. Mike believes that this chapter contains the most important message of his book. Chapter 9 reviews the previous chapters, again reinforcing learning, and the author reveals some of his personal views on the way forward: “I summarise the main points of the book and clarify the role that geological science plays in energy and climate change, specifically in controls, interventions, and mitigations”. At the end of the book is a useful glossary of technical terms. I recommend this book for anyone curious about how our planet works and how we are disturbing its ability to remain in life-sustaining equilibrium. It gives a good grounding into how geoscience will be vital in our ability to solve and adapt to the damage we have done and how to avoid making things worse. Some recommended GEO ExPro articles for reading about the oil and gas industry and climate change and how geoscience is doing its part to help mitigate the damage caused so far. Does it really cost that much to be environmentally friendly in O&G? Digital information technology has taken the world, including geoscience and the petroleum industry, to new horizons of research and data sharing. OneGeology and OpenGeosci are two online sources of immense help to the geoscience community.